As the name suggests, Wyndham Flagstaff is located in Flagstaff, Arizona. If you only remember one thing about the area, let it be this: there are activities to take part in 365 days a year, no matter your interests. From skiing in the winter to golfing and hiking in the summer, you will never be at a loss when it comes to staying busy (in a good way, of course). 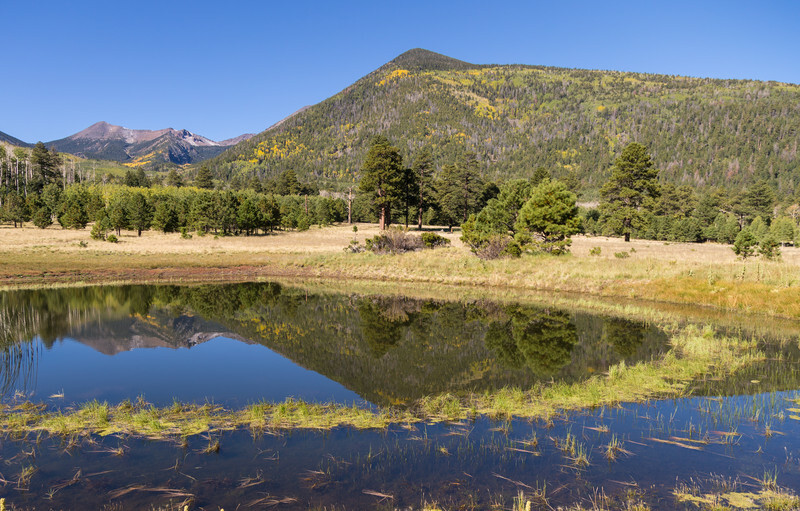 Located on more than 2,200 acres, when you visit Wyndham Flagstaff you will never want to leave. And guess what? With so much to offer on the estate, there is a good chance that you never will. At an elevation of 7,000 feet, Wyndham Flagstaff has received many awards over the years. While its unique location has played a part in this, it is the features and amenities, along with the customer service, that continues to garner the accolades. Onsite, you have access to eight tennis courts, an 18 hole golf course, and indoor and outdoor swimming pools. Are you interested in going fishing? If so, there is a lake 20 miles away that will have you dreaming of landing a monster fish soon enough. While not onsite, the Flagstaff Athletic Club is nearby. With free membership for those who own a timeshare at Wyndham Flagstaff, you will want to come here often. It is the perfect place for those who enjoy racquetball, swimming, indoor tennis, working out on a variety of equipment, and much more. Did you know that it snows in this part of Arizona? Many people find themselves visiting Wyndham Flagstaff during the winter season as Arizona Snow Bowl’s ski slopes have everything you could ever want. From cross country paths to downhill runs, if skiing is your thing you will be spending plenty of time in the snow. Maybe best of all is the fact that the Grand Canyon is a mere 80 miles north of the resort. Anytime you have the desire to see one of the most breathtaking attractions in the world, it is only an hour or so away. What more could you want? Now it is time to learn more about the accommodations at Wyndham Flagstaff. There are four types of rooms to choose from: one bedroom standard, one bedroom deluxe, two bedroom deluxe, and two bedroom deluxe lock-off. From 500 square feet to 1,200 square feet, you can find the right size unit no matter if you are visiting alone or with your family. Other amenities that visitors have come to enjoy include: Starbucks Coffee onsite, Dreyer’s Grand Ice Cream onsite, playground, billiard tables, board games, DVD rentals, outdoor grill and snack bar, basketball court, driving range, ping pong, and a nine hole put and chip golf course. Make no bones about it: Wyndham Flagstaff is one of the top timeshare resorts in Flagstaff, as well as the rest of the state. It only takes a little bit of time on the resort to realize that it is the cream of the crop. The location sets the tone, but the fact that you don’t have to leave the resort to have a good time is what really makes Wyndham Flagstaff special. Add this to the variety of rooms, all of which are well equipped, and you have something that people of all ages can truly enjoy.